Blue Ridge Parkway: great road to ride on, but it actually gets annoying. Savannah: food good, walking good, riding bad. Greenville: challenging routes, courteous drivers. 460 miles over 9 days: feels like ‘spring training’ has already started. Somewhere in the middle of not being able to drive for 3 months, I had told myself that once I was driving again I was getting in the car and going somewhere … anywhere. I needed to at least get farther than Youngstown — the farthest from home I’d been since May. Heading south proved to be a good decision: I missed the worst week of weather since last winter. I stopped on the way down south, and again on the way back, to ride the Parkway where it conveniently crosses I-77 at Fancy Gap, VA.
It’s a unique road to ride on: limited entry and exit, no commercial trucks, good pavement, 45mph speed limit, great scenery. From that standpoint, it’s a pretty ideal setup for cycling. But riding it twice on this trip, something occurred to me: riding the Parkway can be annoying. You always seem to be going up or going down. The grades aren’t that steep or long, but it seems that you can rarely get into a nice riding rhythm. I know that sounds like heresy. It’s still a pretty special road to ride on … but day after day, I think I’d need a different option. Visiting Savannah was primarily about spending time with my daughter. So we stayed in the city, where we could easily walk to where we wanted to go — and all the walking turned out to be really good for me. After walking around for 4 days I felt like I’d completed a round of physical therapy. It’s a great city to visit: not too big, but big enough. Good restaurants. Beach 15 miles away. Lots of parks and other sights to see, just by walking. I wasn’t sure what to expect, cycling-wise. I did what I often do when visiting somewhere new: go to mapmyride.com and look for routes that people have submitted. Riding out of the city, there weren’t too many. I wanted to ride out to the beach (Tybee Island), but the prevailing opinion seemed to be “don’t even think about it” (dangerous traffic). So I essentially rode the same route each day. Anything different seemed to take me on 5 lane roads with heavy traffic … and lots of trucks. Even on the route I took, there were lots of trucks — perhaps as a result of Savannah being a port city. The truck drivers weren’t obnoxious towards me on the bike, but it’s a little unnerving being passed by an 18-wheeler a dozen times on a 40 mile ride. Overall, I liked Savannah, and I would visit again. But I can’t help but feel that they are missing out on something by not being more bike-friendly. It seems like a natural fit: it’s warm year-round, it’s flat, there are lots of pedestrians. Why not embrace cycling too? More bike lanes … rental bike stations for the more casual rider … and then outside the city how about some more roads where you don’t have to be looking over your shoulder for a lumber truck to come screaming by? It seems like a no-brainer to have a safe route to ride from Savannah out to Tybee Island. In contrast, Greenville was riding heaven. Besides the courteous drivers, which I wrote about here, there are many great (scenic, challenging) roads to ride on. If you look on mapmyride, there are pages of routes for the Greenville area. 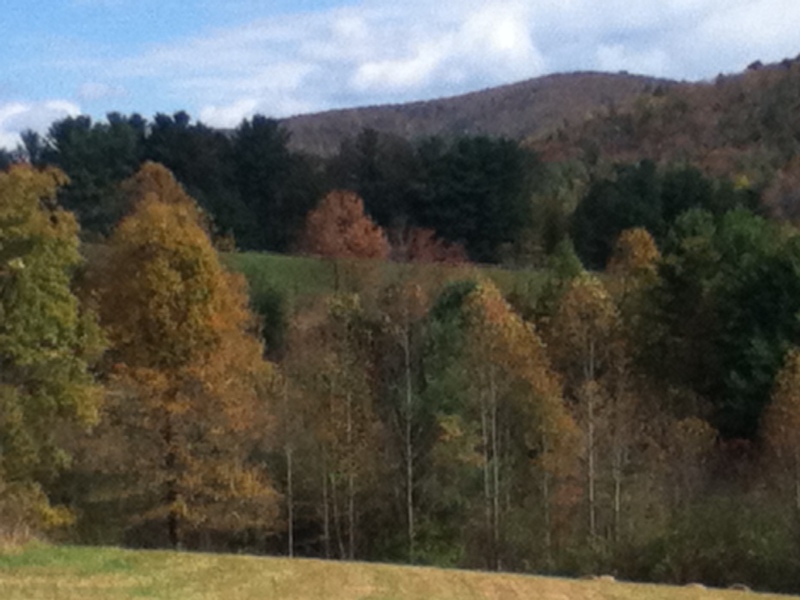 Ride up towards NC and you are in the foothills of the Blue Ridge Mountains. Just about every road that I was on seemed to have markings as part of some ride or another. Overall I got the impression that Greenville really embraces the cycling culture. I will definitely be back. … which included a 3-day stretch of 87, 75, and 94 mile rides (in Greenville). The day after the 94 mile ride, my legs actually hurt. I know I keep repeating myself here: I never imagined I’d be able to do this, so soon. I’m not able to go fast, but I can keep going. I can’t express how good it felt to spend a few entire days doing nothing more than riding, then eating and resting afterward. I had told myself, back in May, that if I were able to get to “just riding” like this, then I would feel satisfied. And so I am. The big shock came when I arrived home to 5″ of snow, no power, and downed trees everywhere. I almost … almost … turned around and headed south again. Something strange happened while riding today: cars were giving me lots of room when passing. On multiple occasions cars — and trucks even! — slowed behind me and waited for a clear chance to pass. No horns honking. No shouts from drivers as they passed. No aggressive accelerations as they went by (yeah, I always love that … like it really makes a bold statement). I gave a wave of ‘thanks’ to drivers a half-dozen times. This couldn’t be just an odd coincidence, so I’m concluding that it’s something with the drivers here in the area — from Greenville, SC up into NC. Maybe it’s because George Hincapie is pretty well known around here. Or maybe it’s because so many people here cycle, or come here to cycle. Or maybe the local cycling community has done something to engender such ‘sharing of the road’. I stopped for coffee in Saluda, NC and a local guy struck up a conversation, asking where I had ridden from, which way I was going back, etc. Said he used to ride a lot too. I mentioned the drivers, and he said that people are used to bikes on the road. But back at home people are “used to” bikes on Chagrin River Road, but that only seems to make it worse. Something else is going on, and I’m guessing that it’s something about attitude. They just accept — however that came to be — that it’s OK for bikes to be on the road. They are not viewed only as an impediment or an inconvenience. I felt this way riding around Europe also. People don’t question that bikes belong on the road. Everyone knows someone who rides. It’s not a problem. I wish I knew how to transplant this attitude. It would mean fewer riders in the hospital — or worse — as a consequence of road rage and impatient driving. I think it would be healthier for driver’s mental health too. If only they could see it that way. I continue to be amazed at the body’s ability to heal … and at the seemingly magical powers of cycling. Today marked three weeks since my first nervous ride out on the road. Since then it’s gone pretty well — way better than I ever would have imagined. This morning I left early to try to beat the rain. Figuring that the ride would be cut short, I started riding a little harder than I otherwise would have. But it brightened up, the rain held off, and so I kept going. 100km is my minimum threshold for calling a ride a “long ride”. At 80km today I decided to go for “long ride” status. I made it, though the last 10km were pretty hard. Crazy thing is that I still can’t quite walk without a limp, but if you saw me on the bike you wouldn’t think anything was out of the ordinary … until I showed you my scar. 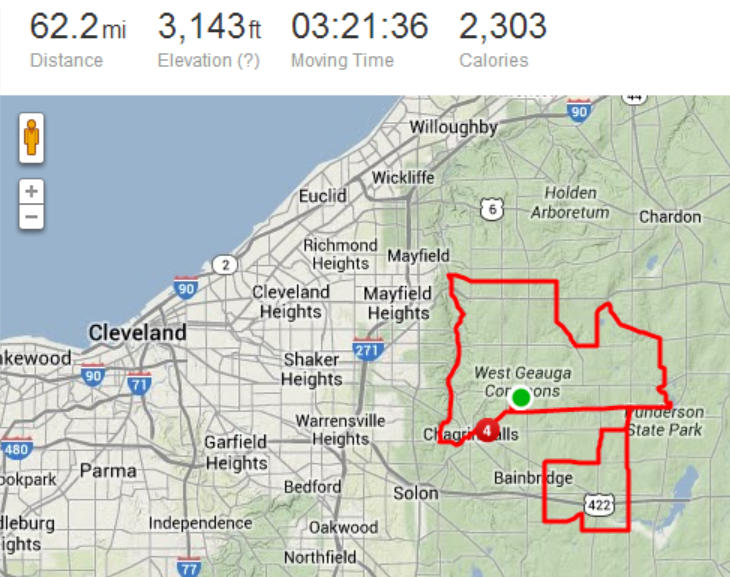 Which I did today while briefly riding with another rider I’d come up on. It’s always good for a “wow”. I think I have to stop using my handicap parking tag though, when parking at work. People are starting to look at me in a funny (not-good) way.